If you want a pet that provides both affection and a measure of protection, consider the German Shepherd. These highly intelligent dogs are loving, loyal and easy to train. They make excellent companions and can also be trained to serve as herding dogs, police dogs, search and rescue dogs and more. Learn more about the breed so you can make an informed decision about whether bringing this type of canine into your home is right for you. The German Shepherd (commonly misspelled as German Sheperd or German Shepard) is a familiar sight in neighborhoods and on television. In fact, it is the top breed choice for Police Canine Units according to the American Kennel Club. Although falsely rumored to be overly aggressive, the German Shepherd Dog (GSD) should really be prized for its great intelligence and strong loyalty to human companions. As its name implies, this breed was developed in Germany to be the perfect herding dog. Its somewhat wolf-like appearance, and deeply menacing bark seem to be the source of rumors about the breed's penchant for attacking people and animals, but this simply isn't true. A well bred and well brought up German Shepherd is a trustworthy member of any family. GSD coloring should be a rich tan and black, but this coloration varies from a whitish tan to a reddish gold. Shepherds also come in a striking solid black and sable. While the breed is available in a solid white version, this coloration is not recognized by the American Kennel Club standards and may not currently be shown at AKC dog shows. As puppies, GSDs are rather boisterous, but gradually become more reserved with maturity. These dogs are quite affectionate with their usual human companions. However, most GSDs will regard strangers with caution until a proper introduction has been made. This tendency makes them wonderful for providing a measure of security for their owners and ought to be praised, not derided. These dogs are highly intelligent, very devoted to their human families and can get along well with other dogs when properly socialized with them. Because German Shepherds have keen intelligence, they are highly trainable for a number of uses. Shepherds take very well to obedience training, often receiving high scores in competitions. Dog obedience training is also highly useful in everyday life, because even though these dogs are not the vicious animals some would have you believe, they are rather large. Teaching them to respond to your commands instantly is a valuable tool. With this breed, potty training is fairly routine as long as you are consistent. Where the shepherd shines best is when it's used in Police Canine Units, and as search and rescue dogs. While the police work has also contributed to the breed's negative stereotype, one should realize that if these dogs were so untrustworthy, no officer would be willing to work with them and no search and rescue team would be willing to send these dogs in to find trapped victims. 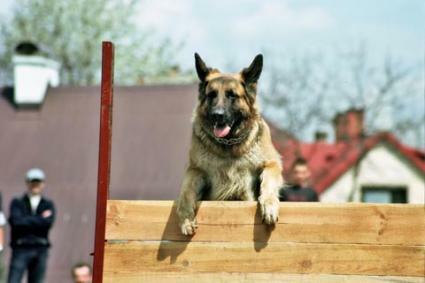 GSDs are put to work in these situations exactly because of their trustworthy nature and ability to think their way through difficult situations. This breed has also made its contribution to the world of guide dogs for the handicapped. Most German Shepherd Dogs have a short, thick coat with slightly longer furnishings at the elbows and rear. Some German Shepherds are of the long coat variety, being woolly in appearance. Shedding for both types is quite frequent, so daily brushing is advantageous to cut down on the amount of hair being dropped on clothing and furniture. It should be noted that the GSD carries a natural musky scent, so it's a good idea to provide a bath twice a month. Nails are usually worn down naturally, but may need trimming from time to time. It goes without saying that any animal rating less than 'Good' should be removed from the breeding program. Certification cannot be completed until an animal has reached two years of age, so be sure to get a written health guarantee on any puppy you may purchase, because Canine Hip Dysplasia may not be immediately observed. Only you can decide if a German Shepherd is the right pet for you. If you are looking for a highly intelligent companion animal that is loving and loyal and you are prepared for the unique challenges of living with a large dog, choosing a GSD may be the right option for you. As long as you commit the time and energy necessary to properly train your new pet, you'll likely form a strong and loving bond with your canine companion.